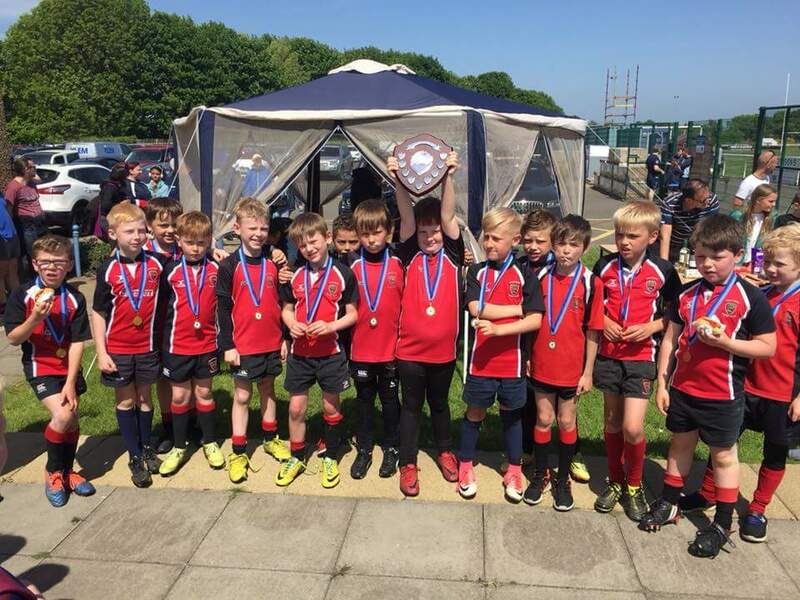 The Linlithgow Wee Reds competitive season ended on Sunday with success all round at a sunny Falkirk Mini Rugby Tournament. A big thanks to Falkirk Rugby Club Youth Section for organising such a great day. Sunday saw the Linlithgow Wee Reds P7’s play in their last tournament at Falkirk. It was a brilliant display from the 10 players, especially P6 Ryan who was excellent. We played and beat the Dunfermline team twice, pretty easily because of our fast hands and physicality especially in rucking. In the great spirit of rugby we played a mixed game at the end which everyone enjoyed. Well done for a great season and congratulations to Ailsa who captained and played fantastically in her last set of games today lifting the trophy! Congratulations also to other Wee Reds Mini teams who all came away with medals, the P4s and the P5s both landing trophies as well. Great day of and for running rugby. 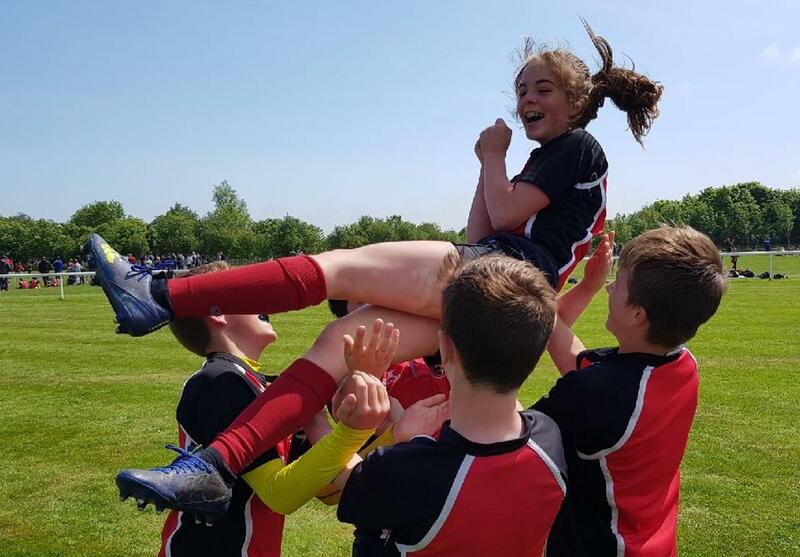 Falkirk shared the Fun and Development ethos that we do and all teams played expansive running rugby. In P6 the home-team, Falkirk, were developing and struggled and rather than push on with a thumping, we mixed up the teams involving, Hillfoot, Falkirk, Linlithgow and to me that typified a wonderful day of fun for all the kids. Great hosts, great spirit and medals at the end for all too. A very bright day at Sunnyside Park Falkirk. Pitch sizes were small, which created a lot of contact, and particularly hard after the recent dry spell. There were 2 pools in the tournament allowing the Wee Red P5s to play the full squad with a team in each side of the draw. Linlithgow Team A started with a good win against Falkirk where it was great to see so many different players getting across the try line. This was followed by a much tougher test against Dunfermline A. We started slowly with a few basic handling errors also running out into touch which lost possession. Falling 3 behind we had to work hard as a team to pull back into contention at 4-3 at the break. The Wee Reds were now challenging more pushing up in defence and much better in the ruck but after a number of phases we lost out to a well worked try from Dunfermline which ended the game 5-3 and finish the group runners up. Linlithgow Team B opened first against Hillfoots who responded quickly, scores went with the restarts before some daylight was achieved between the sides with consecutive scores from the Wee Reds half time 4-2. Hillfoots scored first after the break then further scores were exchanged at either end which made for a really exciting second half for the supporters! The offloading, support play and tackling demonstrated by both teams was commendable. Sustained pressure from the Wee Reds, a good tackle and a counter ruck won turn over ball to run in a winner 7-4. The second game was a comfortable win against Dunfermline B to clearly top the group. Hillfoots won a play off against Dunfermline A to earn a rematch in the final. This again was a closely contested encounter. The Wee Reds got the first try, then conceded 2 by carrying the ball straight into contact where we were turned over in the ruck and a second with complacency in defence. We showed character to come straight back to score from the restart however another was conceded just before half time 2-4. The break allowed an opportunity to regroup after which the Wee Reds retained possession much better by offloading before contact, we began to play teammates into space and support one another much better to score 4 consecutive tries. Hillfoots did not give up they contested to the end and got a reply, the Wee Reds played out the clock 6-5 winners. 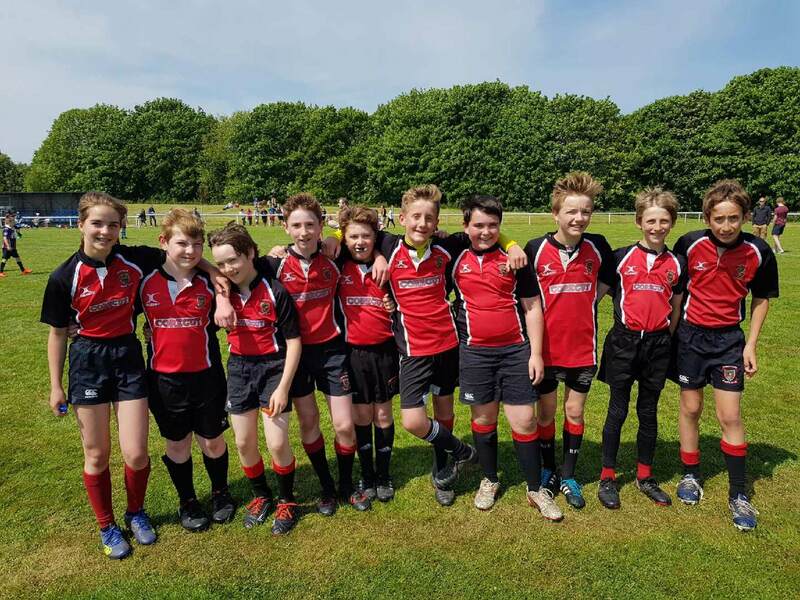 A great squad turn out for Linlithgow RFC P5s in their last fixture of the 2018 season. Well done boys for all the hard work you have put in during training and the successes you have achieved together this year on the pitch, the squad’s skills and sportsmanship have developed really well. A big thank you to all the parents from the coaches and all the players for your continued support. PS following the mum’s Fun Day success last year the boys are very keen to have a wee rematch on Wednesday night so mums and dads please bring appropriate footwear for a big game of touch! Wee Reds P4s Provide Both Finalists! It was another successful trip for the P4s made all the better by the glorious sunshine. We took 2 strong teams to Falkirk that ended up playing each other in an all Linlithgow final. The final was a close fought affair, with the Linlithgow Bulls emerging as the winners by a try (showing how finely balanced the two teams were). Meaning we brought home another trophy. It was a great end to the season with everyone getting a medal.